Take a look at this 1905 photograph (from the collection of the Library of Congress) of the pier and harbour of the English port of Littlehampton. What you see is a tall ship and a remarkably small lighthouse. Or you might want to focus on the high windmill and the squat little tugboat. So if you want a theme for Sepia Saturday 188 (post your posts on or around Saturday 3 August 2013) you could look for photographs that bring together large and small, or big and little. Or, there again, you could focus on the sea, ships, lighthouse, piers or men leaning against bicycles. 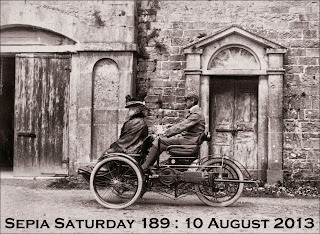 As ever with Sepia Saturday, the choice is up to you : all we ask for is an old photo and some new thoughts. Once you have published your post, just link it to the list below and try to visit as many of the other participants as possible to see what their approach to the theme is. But before you do that, have a quick look at what is in store over the next few weeks on Sepia Saturday. 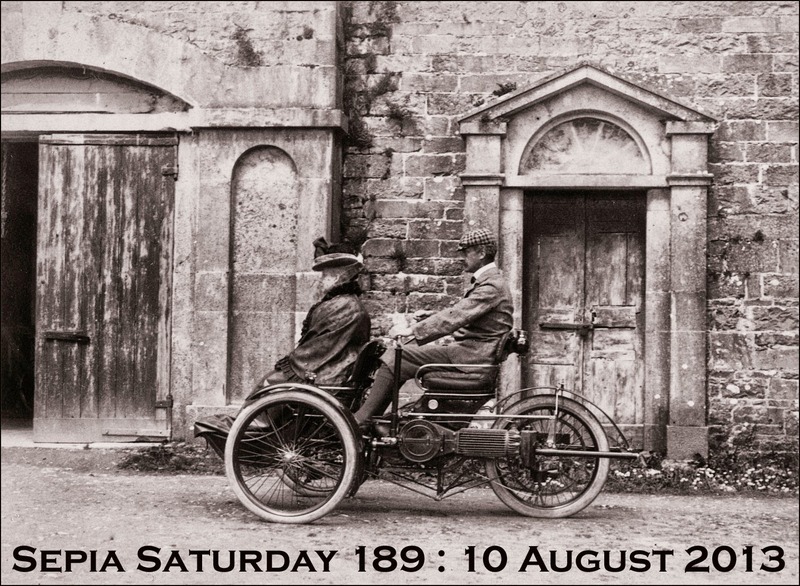 189 : This picture is entitled "What an amazing contraption!". For SS189 we are asking you to feature pictures of amazing contraptions of all sorts, shapes and sizes. Interpret this as you like. 190 : Over the years we have featured all manner of items of dress - hats, boots and most things in between. But now is an opportunity to look at the humble necktie and the smart suspenders (braces). But such thoughts are for the future. 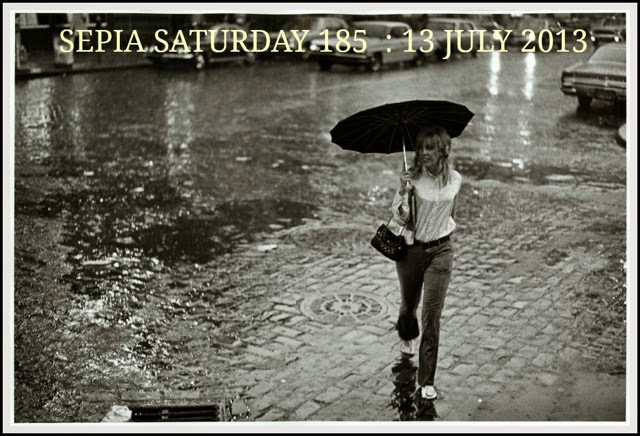 For now all we are asking is for you to post your posts - be they long or short or tall - for Sepia Saturday 188. What is precious, tattered, torn and handed down? To so many of us Sepians, the answer is photographs - family photographs passed on from generation to generation are the currency of Sepia Saturday. But occasionally other things are handed down - and in so many cases it is the family bible that becomes the linchpin of family history. So for Sepia Saturday 187 (post your posts on or around Saturday 27 July 2013) we focus our attention on family bibles. But in the best traditions of Sepia Saturday themes, you can interpret the theme in any way you want : books, lettering, printing, hand-me-downs ... they all fall within our theme this week. Our theme image was specially created from a collage of family bible pictures provided by seasoned Sepians Kathy and Martha and stitched together by Marilyn. 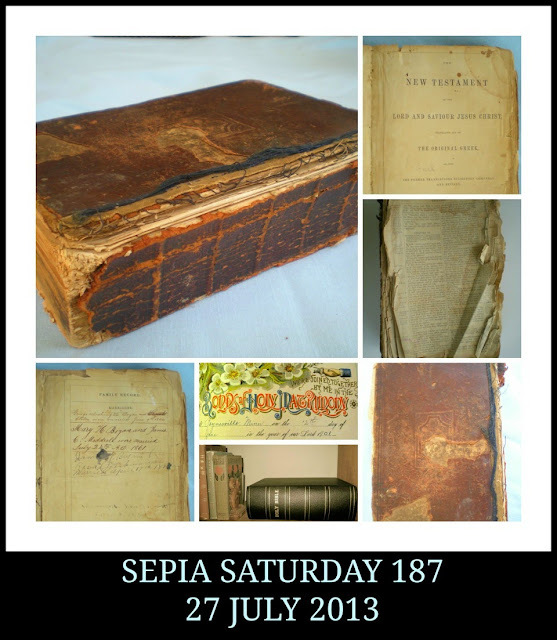 But before you start your bible studies, here is a quick preview of what is in store for Sepia Saturday for the next couple of weeks. 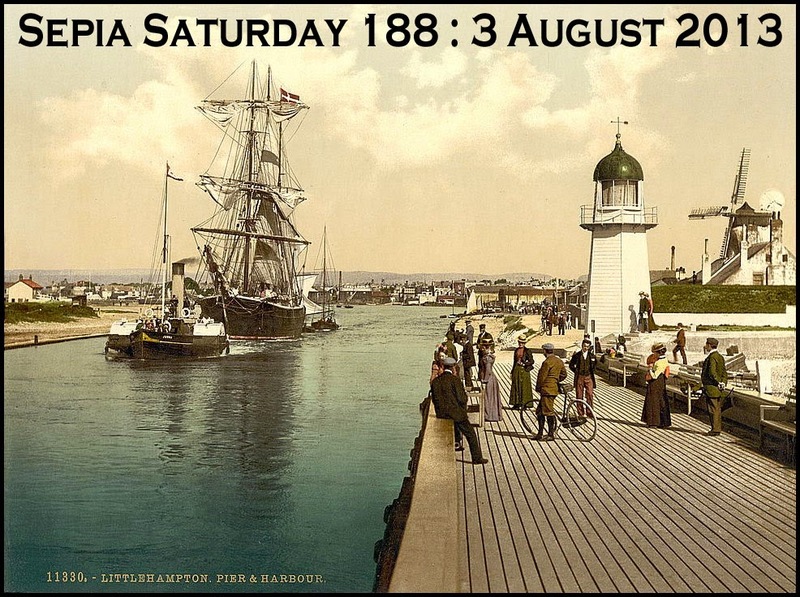 188 : A tall ship, a small lighthouse, and a windmill feature in this 1900-ish photograph of Littlehampton. But there are also cycles, ladies with hats and men with caps. 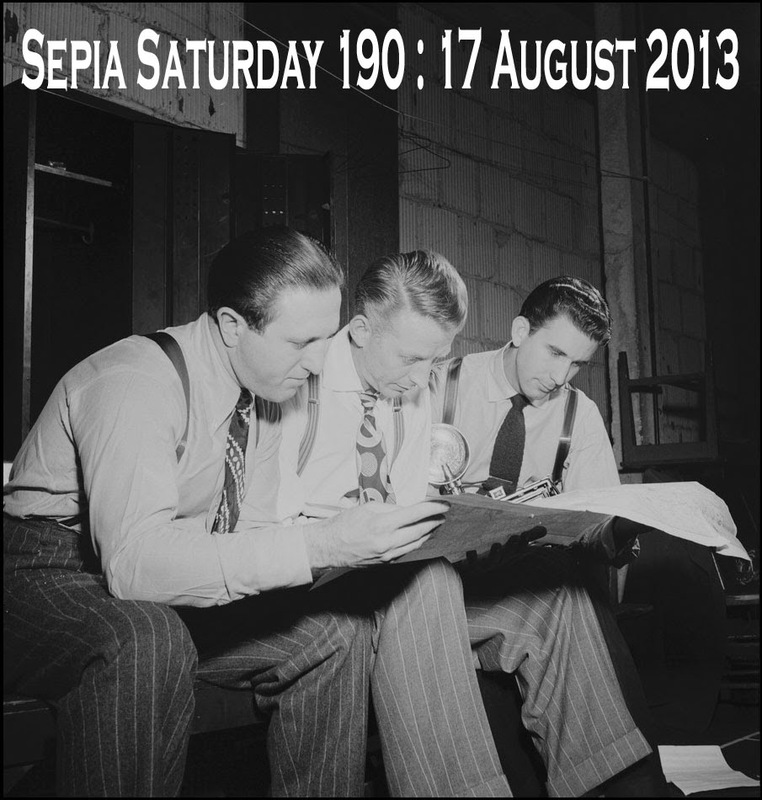 But for now let us concentrate on Sepia Saturday 187. So open your books and start at the beginning. 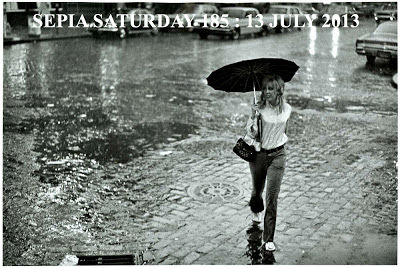 What can you say about this week's Sepia Saturday theme image? Well quite a lot I suppose, but I am too much of a coward to say most of it. Therefore I will simply leave you with the words of my co-administrator, Marilyn, for it was her choice after all : "This fine figure of a woman is either ‘Boadecea or Mother England’ or possibly Britannia. You can choose; or go with armour, helmets, shields, fancy dress, pantomime, theatricals, warlike women or big sticks". 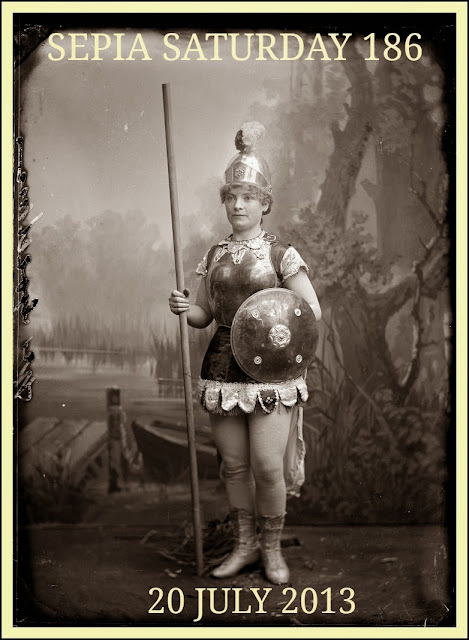 Personally I find the prospect of a warlike woman with a big stick pretty terrifying, and if you do too you might want to join me and make sure your sepia post is posted on or around Saturday 20 July and linked to the list below. The picture, by the way, is taken from a glass plate negative in the collection of the Powerhouse Museum and shared with the world via Flickr Commons. 187 : This theme originated from an idea by Wendy, Kathy, Martha, Marilyn and others on the Sepia Saturday Facebook Page. Bibles, books, and all manner of old family keepsakes could fit in with this theme. 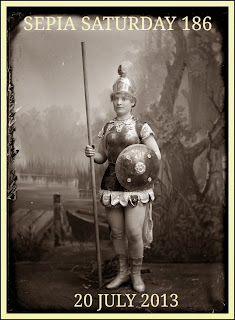 But now we need to concentrate on old Boadecea, otherwise she might hit you with that big stick of hers. You wait 360 days for the slightest hint that there might actually be a sun up in the sky, that summer might actually be a real season rather than a virtual memory that is stuck in there to separate a wet Spring from a rainy Autumn; you wait all that time and then someone decides on a Sepia Saturday theme that concentrates on rain, umbrellas, and parasols. But I am not to blame, the theme picture wasn't chosen on my watch. I am as innocent as a duck in a thunderstorm. as blameless as a pigeon in a puddle. So for Sepia Saturday 185 - post your wet posts on or around the 13th July 2013 - go in search of something suitable and try not to be a drip about it. The theme image chosen by Marilyn has the splendid title "Ave A + E. 7 st" and is the work of the American photographer James Jowers and comes from the George Eastman House stream on Flickr Commons. Those of you with a sharp eye - and Sepians have the sharpest eyes in the business - will have noticed a slight amendment to our Blog Header. A few weeks ago I asked Marilyn Brindley (Little Nell) if she would consider becoming the Joint Administrator of Sepia Saturday with me and I am delighted to say that she has consented. I know how much we all enjoy these weekly thematic calls and it makes things so much easier if we have two people sharing the logistics of publishing them each week. Marilyn has been doing such a brilliant job standing in for me whilst I have been away, she is perfect for the role of Joint Administrator. And whilst I am on the subject, I would like to record my thanks to all of you who have made Sepia Saturday such a success : it would be a dull monologue without you. Before I start filling up and weeping puddles of tears, let me point you in the direction of the next couple of Sepia Calls. 186. This fine figure of a woman is either ‘Boadecea or Mother England’ or possibly Britannia. You can choose; or go with armour, helmets, shields, fancy dress, pantomime, theatricals, warlike women or big sticks. That is enough for now. Rain has stopped play. So get some shelter, post your posts for SS 185 and then add a link to the list below. The image I’ve chosen this week is a little different as it is not a sepia photograph, but it does have an historical context and it pays tribute to a remarkable discovery. 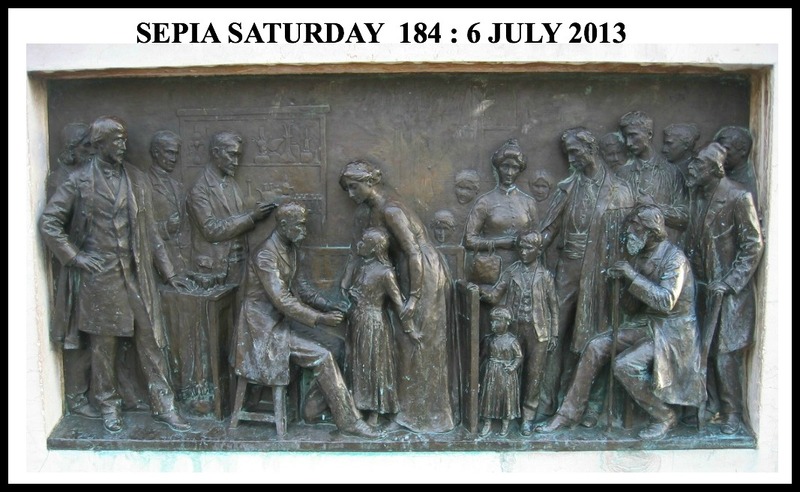 On this day, July 6th, 1885 Louis Pasteur successfully treated a boy with rabies vaccine.This plaque in Arbois is one side of a pillar dedicated to Pasteur and his achievements. It comes from Wikimedia Commons (public domain). Now, before we go any further, let me state right at the outset that there is absolutely NO need to try and match the prompt picture. It doesn’t have to be a picture at all (see the information box on the right), and we welcome any response. We would just like you to join in and have fun. Many of you do like the extra challenge however, so to get you started, here are my first thoughts on where this prompt may take you: commemorative plaques, memorials, sculptures/sculptors, group portraits, medical science, famous (or not) scientists/doctors, anything French, mad dogs! 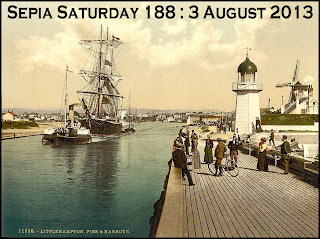 After you've published on your blog, somewhere around Saturday 6 July, don't forget to add the link to your actual post (by clicking on its title within the post and then copying the URL which this generates) to Mr Linky, and then leave a comment below. Please link back to this Sepia Saturday page, and there is a mini-banner to add too if you choose. Feeling pretty pleased with yourself by now? Share the joy by visiting as many other contributors as you can. If the mood takes you leave them a comment as well; we Sepians thrive on comments, and being a courteous bunch we will try to return the favour. Not one Sepian told me where ‘caverns measureless to man’ came from in last week’s call. It was of course, Coleridge’s ‘Kubla Khan’. Didn’t any of you have to recite this at school? Just time to mention that we have a Facebook group where those genuinely interested in dialogue with other Sepians, are welcome. We share ideas, jokes, picture and give technical support. In fact the prompt for SS 187 came from a thread on that very page. Something else to tantalise you with. Before you start chiselling away at this week’s challenge, here are the peeks into the next two prompts, to give you some thinking time. 185: To many of you this is an all too familiar scene just now. Midsummer has past and some of you have yet to see much of the sun. Sepians are scattered all over the globe however, and whatever the weather where you are you're bound to find some images of umbrellas, parasols, or even bus shelters! Time to run for cover? Off you go now and seek some relief in your search. Happy delving!